There’s nothing quite like the satisfaction of getting something done that I’ve wanted to do for a long time. Like many people, I’ve been leveraging the impetus of the New Year to rearrange some items in my life, in particular purchasing a treadmill for under my desk and rearranging furniture in my office. I love the fresh feel of seeing my world in a new way. 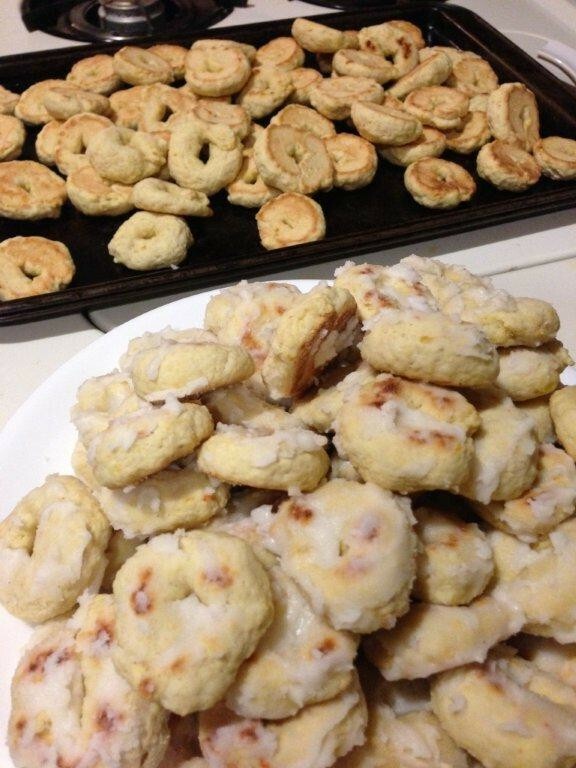 For years, I’ve wanted to make my Aunt Elisa’s Christmas cookies. Elisa was my grandmother’s older sister and everyone’s favorite great-aunt. She and my Uncle Manny never had any children, and so all of the nieces and nephews were smothered with their love, often in the form of food. Of all my close relatives, Aunt Elisa and Uncle Manny were the only couple that stayed together. I think we all clung to the ideal of the joy and love they shared as much as anything else. All the women in my Italian family cooked, of course, but Aunt Elisa took it to a whole new level. Uncle Manny was her sous chef, and it was a familiar sight to see them working side by side in the basement kitchen of Nana’s house. When everyone gathered at the farm for holidays, it was as if the cooking went on for days. Nana, Aunt Elisa, Mom, Tia, and Aunt Dot would all work together producing mountains of food – cookies, pies, cakes, pastas, breads, sausages, you name it. And while their Italian tempers were often short, the laughter was just as plentiful. As a child, I wove in and out of the activity, running in to grab a cookie from the cooling racks and racing out the back door to play with my cousins. Full of memories, each year I would pull out the recipe, hand written by my Aunt Elisa in an old letter. Each time I read it I would shake my head in disbelief…2 ½ dozen eggs? Seven pounds of flour? A pound of butter, followed by another pound of Crisco? 18 teaspoons of baking powder? (This last ingredient is followed by a note in parenthesis — “guess work”). The list went on, in quantities much too large to fathom for a NYC kitchen. So each year I would put the recipe away. After scaling the recipe down to something more reasonable, Jon went to the store to buy some of the more obscure items like orange and lemon extracts, which then sat on the counter for a few days daring me to actually use them. And so finally I decided to go for it. I had an hour between finishing Isabel’s homework and the time that Julian would get home, which should be plenty of time, right? Even after reducing the recipe to a quarter its original size, it still called for 6.5 cups of flour. I pulled out the biggest bowl I had and began adding the ingredients. It was all “guess work” for me… 2 ½ dozen eggs quartered equals 7.5 eggs – should I go with seven or eight? Isabel was cracking them, so eight it was. Ok, so finally the ingredients were all together, but since I had never actually made these before, it was impossible to know if the consistency was correct. I only remembered the finished product — glazed yellow, green and white cookies shimmering on the plate. I read on, ready to bake. “Take a small batch, just like if you were to pinch one’s cheek – and with a little olive oil on your hands – roll like a rope and close it like a doughnut.” This has always been my favorite line. But now, faced with actually doing it with the real dough, I wondered: what size cheek? A baby’s cheek? A child’s cheek? I remember my relatives doing just that – pinching my cheek, as I was “Little Lizzy” to them. I pictured their hands on my face, which I probably hated at the time, and the small amount of flesh they gathered there. Winging it, I tried various sized pinches until the rope seemed the right length. Then close them like a doughnut I did, laying them out on the cookie sheet. Finally ready to bake. The instructions read, “Be sure your cookie sheet is evenly greased with oil (oy, had I done that correctly?) – put in oven for eight to ten minutes, turn them over to brown lightly – work fast – when done have a box or basket lined with wax paper and slowly drop them into it.” Hmmm. Ok, eight minutes later, I pulled them out… had they browned adequately? I tentatively turned one over. Uncertain, but feeling the pressure to “work fast,” I was committed, and so started flipping. Ok, got through that. Back in for two more minutes… Wax paper? Again, the vision of layers and layers of wax paper placed between precious cookies flashed before me… but instead I pulled out the cookie rack and cooled them that way. Oops, before I knew it, it was time for Julian’s homework. This is why Aunt Elisa could cook all day – she never had children’s homework to do. Two hours later, the kids needed to get to bed, and I still had half the dough to roll and cook. Next. “When you have finished all the dough – next day – frost them.” Next day? Oh, right. If you’ve just spent 6 hours making ten lbs. of dough and baking it, you probably have to wait a day to get to the frosting part. Not wanting to leave the rest for the next day, I forged ahead and made the frosting. Ironically, her instructions say, “When I make mine I don’t make a smooth fondant icing because it takes too long but if you have time – place each one on a rack and pour thin icing on it or use a knife.” I went for her faster method of “gently mixing the cookies into the icing.” Picturing her skillful and pudgy hands in the frosting, I tried to emulate her actions, which turned into essentially rubbing the frosting onto the cookies with my fingers one by one until I’d run out. Of frosting that is… there were still a few dozen cookies unfrosted on the rack. Ok, yes, tomorrow. Or maybe they taste ok unfrosted dipped in coffee? Finally it was time to taste. Yes, that pungent lemon spark as the frosting hit my tongue was just as I remembered, though it was hard to tell if I’d gotten the texture of the cookie right. Putting the recipe away, my eyes scanned the ingredients again. I noticed a note I hadn’t paid attention to before. “1 lb. of butter and 1 lb. of Crisco } melted (not hot)”. Melted? Whoops. No wonder the texture didn’t seem right. And so I am reminded that sometimes the vision of how something will be when I finally get around to doing it doesn’t necessarily match up with the reality of how it turns out. Still, I was ready to share them with the kids. I carried two over to where they sat reading, and offered them up. Isabel took it from me willingly. As she looked up at me with her brown eyes, I suddenly saw myself sitting there as a child, and for a moment I became Aunt Elisa, sharing the goodness of my creation. And I knew that my affection for these cookies came not from their flavor, but from the love I felt from those who were offering them to me.